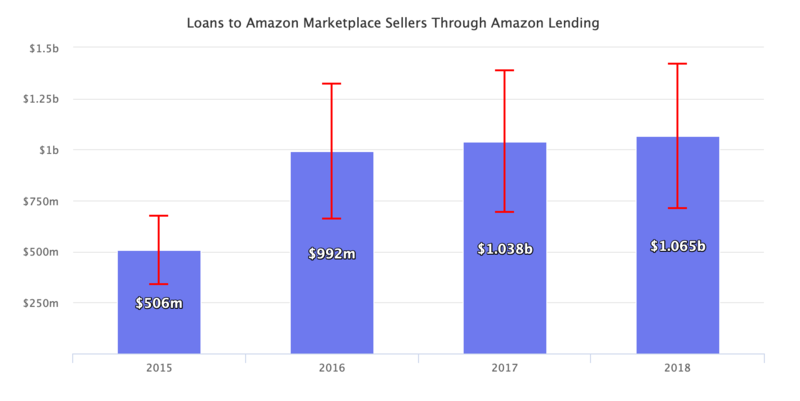 Every year for the last three years Amazon has lent more than $1 billion in short-term business loans to sellers on its marketplace. Amazon lent more than $1.5 billion from 2011 through 2015, and surpassed $3 billion by June 2017; both according to Amazon’s announcements. According to our estimates the program will surpass $5 billion in Q2 2019. Launched in late 2011, Amazon Lending is an invitation-only program that makes loans of $1,000 to $750,000. Terms are from 3 months to 12 months, and interest rates typically range from 6% to 14.5%. The loans are intended for expanding inventory, and are not meant to be a major profit driver for Amazon. Instead, their goal is to support the marketplace flywheel. The company doesn’t report the total loans amount, nonetheless it reports seller receivables at the end of a year, which are amounts due from sellers related to the lending program. Seller receivables have increased from $337 million in 2015, to $661 million in 2016, to $692 million in 2017, and to $710 million in 2018. Since the loans offered have the maximum terms of one year, the total loans amount is at least that of seller receivables, though closer to twice that number. Some of the loans offered have 3, 6, or 9 months terms allowing the fund to be cycled multiple times in a year. Seller receivables, and thus the total loans amount, grew less than 5% in 2017 and less than 3% in 2018. “One person familiar with the program said there was a deliberate effort by Amazon to slow the expansion in 2017 as the company attempts to better understand the credit risks that come with a large-scale lending practice,” wrote Eugene Kim for CNBC. The program remains invite-only and so far Amazon has continued to throttle its growth. Only a “very, very small percentage” of Amazon’s loans default, Peeyush Nahar, vice president for Amazon Marketplace, said in an interview. Unlike a bank, Amazon offers loans by utilizing sales history, inventory levels, and other data on the marketplace, instead of the traditional credit score. In turn, the default rate is considerably lower compared to most banks. This drives the Amazon marketplace flywheel. Lower prices lead to more customer visits. More customers increase the volume of sales and attract more third-party sellers. New sellers grow selection and lower prices through competition. Feed any part of this flywheel, like providing loans to sellers, and it accelerates the loop.